I was tasked with two models at the start of the Heroes of Armageddon project. I have been able to complete one of them. 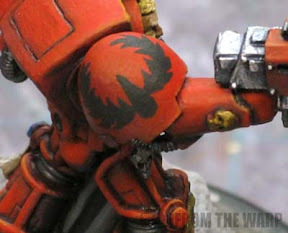 The Blood Angel Terminator Banner Bearer for the Blood Angels army. He may not be much, but if you're going to do one model in four armies, you better make sure he stands out from the crowd. He's more eye candy than anything else. I'm not sure how he'll fit into the list in the end, but he'll look the part nonetheless. At this point, he is complete and I'm going to go through some of the process I did in building and painting him. 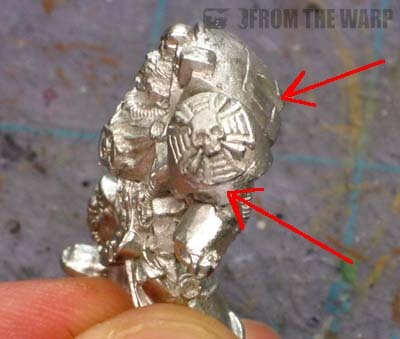 He started out as the metal Terminator Captain. Had we been a few more months along, I might have been able to pick him up as a Finecast model to do some experimenting on, but that was not to be the case. I had to do the regular work to him, cleaning some mold lines, smoothing out some surface defects, etc. Being metal and holding a huge banner in the end, this guy needed to be pinned to his base so I took care of that early on as well. You can see on the pic that his left hand has been cut away. Even though this guy might not take the field, I wanted him to be accurate enough that the winner can use him if he or she chooses to later on without any troubles. That meant giving him a storm bolter and replacing his normal hand with a plastic powerfist holding the banner pole. I also had to trim away the bottom of his crux on his left shoulderpad since this guy was going to be a banner bearer and not a squad Captain. I also had to fill in the slot for his personal banner on his back since I wasn't going to be using that either. A bit of greenstuff work in each area and I was all set for paint. Painting this guy was fairly straight forward. 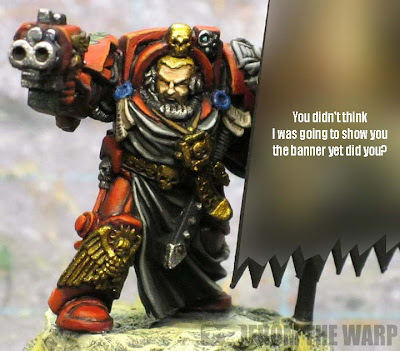 I went with a slightly darker look both on the model and the banner as you'll see in an upcoming post. He was primed a light grey color to help me with the reds. I started out with GW Mechrite Red followed by a series of washes to get the shaded areas. Baal Red, Thraka Green and Asurmen Blue for the darkest points. I wanted to keep away from using Black because I didn't want to mute my colors so much. It's similar to my regular process for painting red with a few changes as I'm learning new things. With the shadows in place, it was just a matter of working the highlighted areas back up to a pure red color. I elected to make his robes black since I don't see it often and the banner was going to be black in the end. I figured it would help tie them together somewhat. With the armour done, I finished off the smaller detail areas to complete the model. 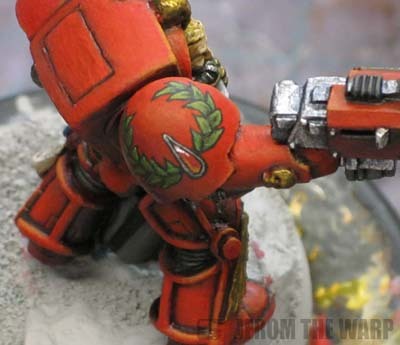 One of those being the freehand on his right shoulderpad. This was going to be the toughest part outside of the freehand on the banner. The reason for that was the fact that the underlying area (the shoulderpad) had already been completely blended and any mistakes now would spell disaster. 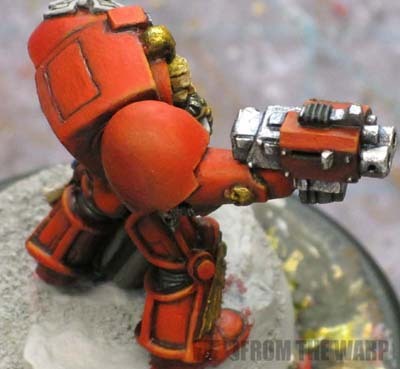 Just as important as knowing how to do freehand is knowing WHEN to do freehand and what to expect when you go to paint it on your model at certain stages. I knew I was going to have to be very careful with how I added my design since I'd have very little room for error. The first thing was to block out the overall freehand design with black. This would give me an area to work in and a fine black line around the design in the end. I started out with the blood drop in the center. Actually, let me back up and say that I went with the standard "banner bearer" design of the laurel. It's apparently what banner bearers wear after doing a little bit of further research on the topic. I did alter it slightly to make the center gem into a blood drop instead. Once I had the whole thing blocked out, then I started adding the individual elements inside my outline. Each leaf was painted in and then shaded and highlighted along with the blood drop in the center. I think it came out fairly well in the end and it follows the Codex for what those guys would have there on their armour. If I'd been smart, I would have painted the base before attaching his left hand with the banner. It wasn't impossible to do later on, just a bit of a pain to work around all that extra stuff. 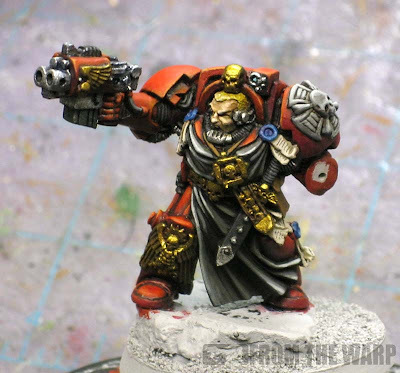 I decided his hair should be blond since I never do that on any other models and it just says "Blood Angel" to me. I don't know why, but I just imagine them all having blond hair for some reason. I have that mini in my collection and I've always liked it. I think you've done a great job on it and I can't wait to see the banner. The Inner Geek: Thanks. I've always thought this guy had a great pose. Pretty dynamic for a metal model when he came out. Lord Saurax: In due time. How about this... there will be another sneak peek this week with someone else (another blog) posting a WIP shot at the end of the week. The full banner will be shown here next Monday in a big post. Oooh, mean... taunting us lile that. I'll be interested in hearing some honest opinions from you guys once I do post it too. He's superb,a great way to use a cool model that otherwise doesn't have much place in a BA list given the captain's stat line vs pts cost. That shoulderpad freehand really looks the part and imho makes the model so far. (Of course I fully expect it to be outshone by the banner when you treat us with a look at that!) I like the black cloak too, its unusual enough to be a suprising choice, which should help it stand out without looking out of place. Crosser: I figure there will be tons of red in the army (naturally) and most of the time the tabards we all paint are some shade of bone... so I went the other direction and tried to tie the model to the banner so to say and made both black. Anyone knows if the new finecast version of this model has been re-scaled or he still keeps the old terminator proportions that were slightly shorter than the current plastic models? Kynikos: That's a good question. 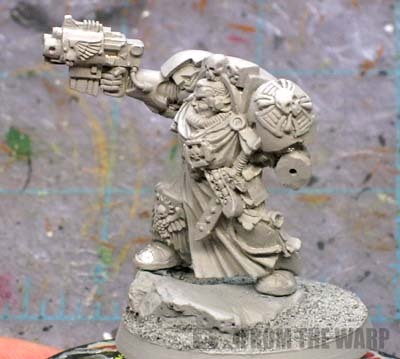 I haven't seen this guy in Finecast yet so I can't say for sure. Looks incredible Ron, an excellent contribution to the project. Thanks Dave, but have you seen some of the other work out there? I'm just trying to keep up with the rest of the guys.